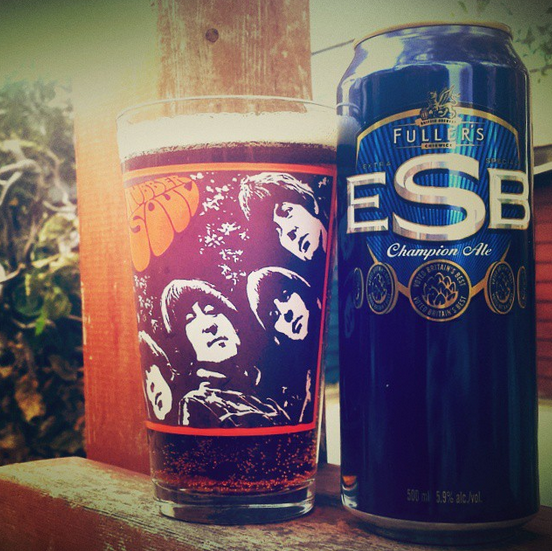 Classics Revisited: Fuller’s ESB | Beer Is God. Fuller’s was founded in 1845 in London, England. Their Extra Special Bitter (ESB), around since 1971, is a twice named World Champion Beer, and is a strong(ish, for an English ale: 5.5%), smooth, full-bodied ale. It is Extra Special because they already have a Special bitter in their flagship London Pride. In England, anything over 4.8% is strong, because traditionally you would drink these all night in some homely pub to escape the dreariness of life and be among friends. Or you’d be drinking all day on the job: since beer is initially boiled, there was a time when it was safer than drinking water (and still is in many parts of the world). I first had Fuller’s ESB on tap at Town Crier a couple summers ago, and quite liked it. I have always remembered it fondly. According to Wikipedia, The beer was rebranded from its old black and red livery, to the current blue and gold in late 2004 in an attempt to shake off its reputation as a very strong beer. It is sold in both 5.5% cask conditioned form as well as pasteurised at 5.9% in bottles and kegs. It is brewed with Pale Ale and Crystal malts, bringing both biscuit flavours and soft malt toffee notes to the fore.